Sean William McLoughlin, or Jacksepticeye as he is better known to his millions of fans is one the biggest stars on Youtube right now in 2018. 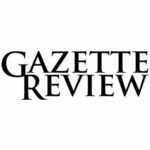 Jack combines a vibrant personality bursting with enthusiasm and excitement, with a steady stream of high-quality professional videos he uploads to Youtube daily. His work has seen him gain over 16 million subscribers who have viewed his thousands of videos over 7 billion times in total. Jack’s usual Youtube output consists of his steady fast-paced commentary, it’s half stream of consciousness and half cheerful banter, but it works like a charm for Jack, and it’s made him a millionaire many times over. Thousands of people make a reasonable living from Youtube, but Jacksepticeye is right at the top of the heap, his channel is the 31st most subscribed of all, and if you discount the VEVO channels and just look at the gaming/vlogging genre. Jack has almost as many subscribers as Markiplier and JennaMarbles, with PewDiePie having more subscribers than the three of them put together. Being a successful Youtube personality gamer is highly profitable, and Jack’s one of the most popular, but how did he grow his channel so quickly, and how much does he make from his work now in 2018? Read on to find out. How Did Jacksepticeye Make His Money & Wealth? Jacksepticeye habitually starts his videos with his trademark ‘Top o the mornin to ya Laddies’ before launching into another non-stop stream of comments, observations and jokes, all of which are original and apparently made up on the spot. 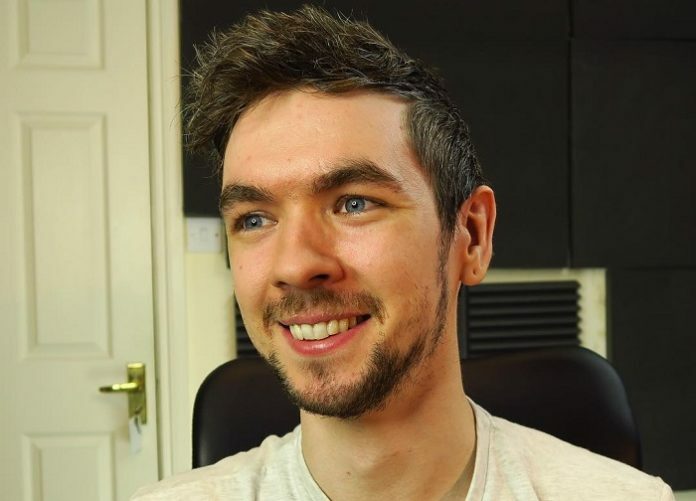 After thousands of videos featuring his lively personality it appears that Jacksepticeye is still yet to repeat himself even once, even a little bit, if there’s one thing that Jack has buckets of to spare, it’s casual, entertaining chat that appears to be continually spontaneous and easy for him to achieve. Jack’s ability to always have something to say, no matter how obscure or unexpected, and turn it into an interesting fact or something to laugh about is what keeps his comedy as fresh and lively as ever, and it’s what has lead to his collaborations with some of Youtube’s biggest stars. Jack picked up his nickname in childhood in Athione, Ireland. During his early years he was interested in music, and played drums for an indie rock band called ‘Raised to the Ground’ while he was at college. He began uploading videos to Youtube in November 2012 and his first attempts at entertaining were enthusiastic, but a long way from the polished professionalism of Jack now in 2018, yet the videos met a small positive response from the Youtube community, and Jack began uploading regularly. His twice weekly uploads quickly improved in quality and Jack’s fanbase began to grow quickly, as he approached the million subscribers mark in late 2013 he began uploading regularly every day, and then twice daily, a workload he has maintained ever since. When Jack reached a million followers on Youtube in August 2014, his confident banter was already well established, and his positive outlook had created a strong community following that avoided much of the infighting and drama that other big Youtubers got involved in. He received a surge in popularity in 2013 when Pewdiepie mentioned him in a video, and the two formed an early friendship, Now they have collaborated on many videos together, and frequently mention each other in their videos, usually comically or in mock drama, but Jacksepticeye is well-known to many of Pewdiepie’s 56 million subscribers, and most of them like the sort of videos that Jack produces too, comedy gaming is a specialist niche that’s hard to get right, but Jack and Pewdiepie are two of the most popular. Jack’s workload is generally two videos a day on average now in 2018, but he doesn’t seem to view video making as a task at all, it’s just what Jack loves to do, play some games, talk some banter and have a great time, and the videos gain Jack several million views a week. He takes his success in his stride and it doesn’t seem to have changed his cheerful demeanour at all. Jack is still as original as ever, and as entertaining, and his videos are perfected edited pieces of work, with nothing out of place, but they still have a home-made feel to them because of Jack’s friendly personality. 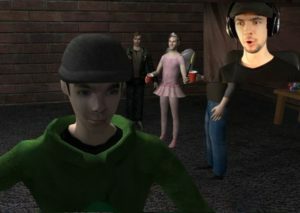 Jack playing his custom-made 1 million subscriber game, with Pewdiepie in that pink dress in the background. His million subscriber celebration was playing a game made especially for him for the occasion, it was a masterpiece considering it was a fan-made game made by a single person, and Jack’s commentary throughout his play through was magnificent, as he met a pink dress wearing Pewdiepie at the million subscriber party depicted in the game, which happened to be called ‘Jacksepticeye’s Million Subscriber Party Massacre’, and which inevitably descended into the zombie-infested bloodfest that we all knew was coming sooner or later, but for people to be making games about you, that’s quite a tribute, and Jack’s sincerely humbled reaction to the game earned him even more fans. Jack was enjoying great financial success due to his success on Youtube by then and was earning a living of up to $40,000 per month with views topping 60 million in several months of the year, by February 2015 his subscriber count had topped 3 million and the Irish Examiner interviewed the top Irish Youtuber on his rise to ‘Stardom’. Jack admitted that the job was the best paying one he’d ever had but also revealed that he worked 12 hour days to produce two videos daily, with another three to four hours replying to comments and messages, yet it never seems like work to Jack, he’s a professional entertainer to a tee, and we all get invited to enjoy the ‘assault on the senses’ that are his videos, in his own words you either love or hate him, and millions of people are firmly standing on the love side of that line, and that number is still growing rapidly. In 2016 Jack co-hosted the artistic conglomerate of festivals and conferences that comprise the annual South by Southwest event in Austin, Texas that is growing wildly in influence and popularity, and that year his Youtube earnings topped a million for the first time. Jack’s actual earnings for the year are not known, but it’s conservatively estimated that he took over $2 million for his years work, and his subscriber count grew exponentially, before the year was out he acquired 10 million, and now in 2018 several events both good and bad have started off a lively year for him. Jack has collaborated with plenty of top Youtubers, mainly fellow gamers with a big personality, but his association with Pewdiepie, the most popular Youtuber of all has gained Jack many new fans. In 2017 Pewdiepie’s controversial, and slightly unwise, content choices lead to a small storm of negative attention being heaped upon him, and Jack was an unfortunate victim of that. 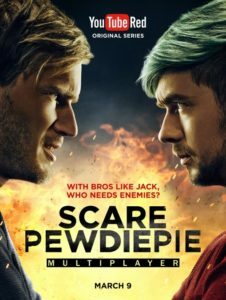 Pewdiepie’s second season of the TV show ‘Scare Pewdiepie’ was scrapped before release as a result, and Jack’s starring role in the series as the main antagonist was scrapped too, an unfortunate result for Jack through no fault of his own, but he hasn’t skipped a beat, he’s simply gone on to bigger and better things without ever saying a negative word about the entire situation, entertainment always comes first with Jack. Jack moved to Brighton, England in May 2017, and happily shared the excitement of moving to a new country in one of his regular vlogs, which are as well received as his daily gaming videos, and his likeability and overwhelmingly positive nature have seen him hosting the Level Up! Games panel at the D23 Expo, and the announcement that he will be featured on the Disney XD channel later this year. With over 16 million subscribers currently, Jack is becoming hugely successful on Youtube, and so far he’s managed to do it all while just playing a few games, and having a great time, with those 12 hours of daily work quietly happening behind the scenes. Jack began dating Danish Youtuber Wiishu in 2015. Wiishu posts vlogs to her 400,000 subscribers and occasionally features Jack, or Sean as she prefers to calls him, to her very different audience. The couple seem very happy together and currently live together in Brighton. Wiishu also features fashion content on her Youtube channel and travels to LA frequently, often with Jack. So far the couple have not had children or made any plans to get married. Jacksepticeye’s popularity on Youtube is growing at an enormous rate, and so far he seems to be one of a select few gamers who will enjoy multi-million dollar annual incomes in the future. Jack’s ability to upset no-one, and still remain fresh and original to his strong community of followers has seen those 12 hours of work a day pay off to the tune of several million a year in earnings for him. His income for 2018 is likely to be in the region of at least $4 million, with his income being boosted further by merchandising and endorsement deals, often featuring ‘Septic-Eye-Sam’, his trademark symbol. How much money does Jacksepticeye make per video? Jack’s twice daily videos are viewed on average about 1.5 million times after a week or so, Youtube earnings vary depending on many factors, but Jack is clearly earning at least $5,000 per day, and it’s more likely to be over $10,000. Occasionally one video alone earns him at least that, and even though he produces such a high number of high-quality videos, the vast majority of which are gaming play-throughs, Jack seems to achieve good success with all of them and 80-90 million views most months, earning him an income of at least $150,000 monthly. Jack now lives in Brighton, England, close to his long-time friend and Youtube partner Pewdiepie, the two continue to collaborate on various videos and the friendly banter between them is always well-received by both their audiences. 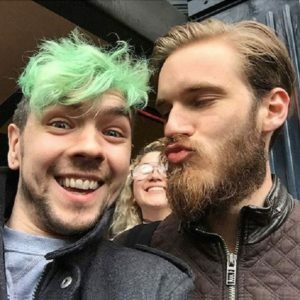 The biggest stars on Youtube today are gamers with big personalities, and Pewdiepie and Jacksepticeye have both perfected their winning formulas, although Jack is still as enthusiastic about the whole thing as ever, while Pewdiepie and others often show little of their former enthusiasm for their game-playing role. 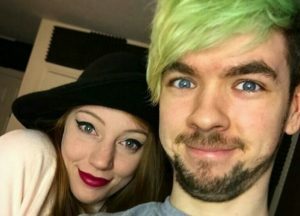 Jacksepticeye has recorded videos and streamed live for charity many times in the past, his customary green-hair was originally part of a charity bet between him and Markiplier, and not only did the green hair stay, but Jack has continued to raise millions for charity from time to time. In one event alone, Pewdiepie’s ‘Cringemas’, which was streamed live on Youtube in December 2016, Pewdiepie, Jack, Markipliers and several other big Youtube stars raised over $1.3 million in two streams, with all the proceeds going towards RED, a nonprofit organization supporting AIDS and HIV charities. Even though the two Cringemas streams lasted over 15 hours, donations poured in at an average of $2,700 per minute, or $45 every second, Youtube stars like Jacksepticeye influence millions, and Jack can only become more popular and influential as time goes on. Previous articleKesha Net Worth 2018 – How Wealthy is the Singer Now?